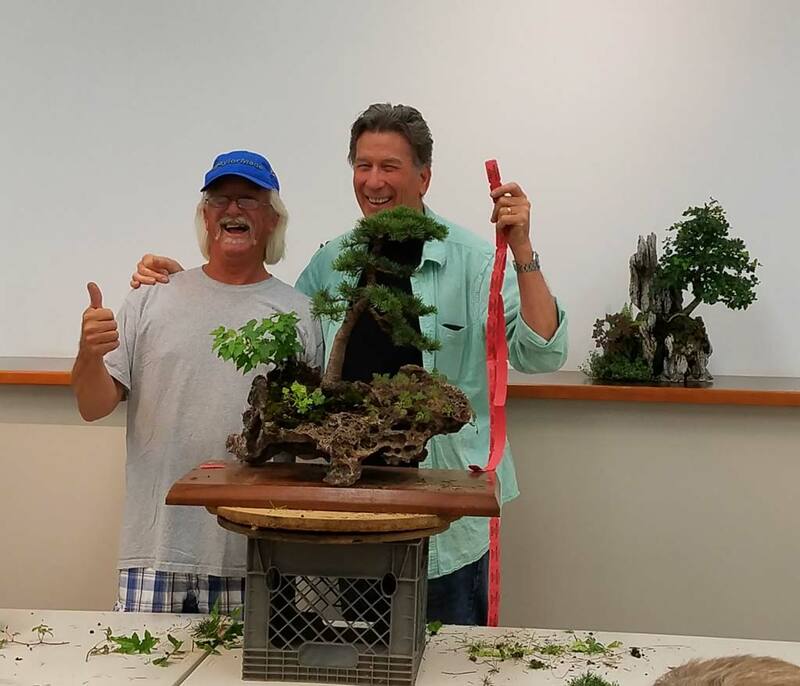 The June 6, 2017 meeting of the Marin Bonsai Club featured our very own Jay McDonald, who demonstrated some work on a sizable, two-tree rock planting, which was raffled off at the end of the night. 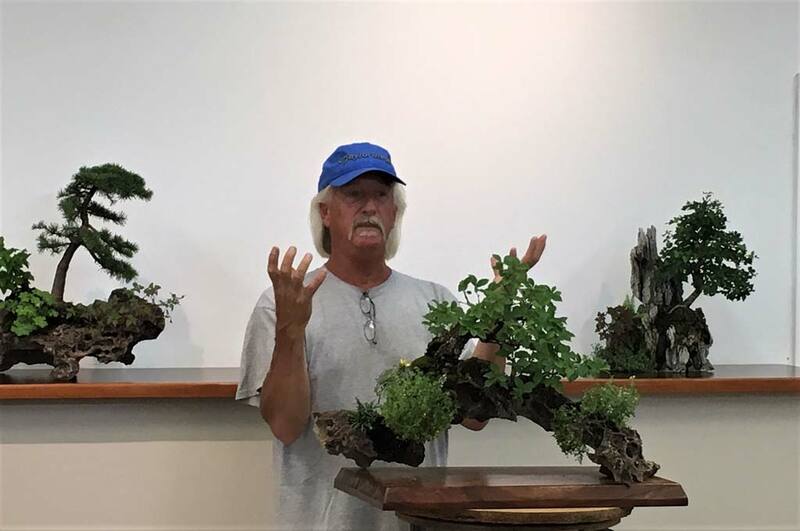 Jay had assembled the planting earlier this year, almost completely from materials he obtained at the Golden State Bonsai Federation’s Mammoth event in February. 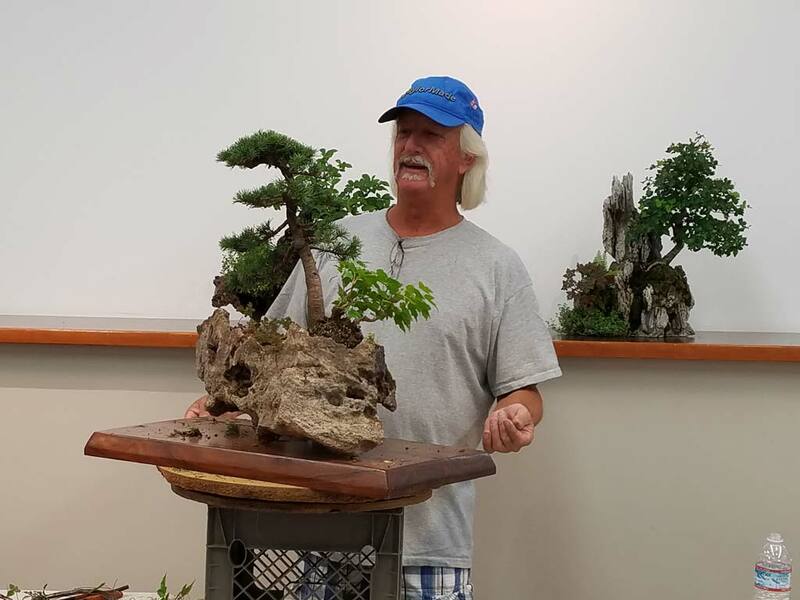 Its well-established health was a testament to Jay’s skill with this fascinating subcategory of bonsai artistry. 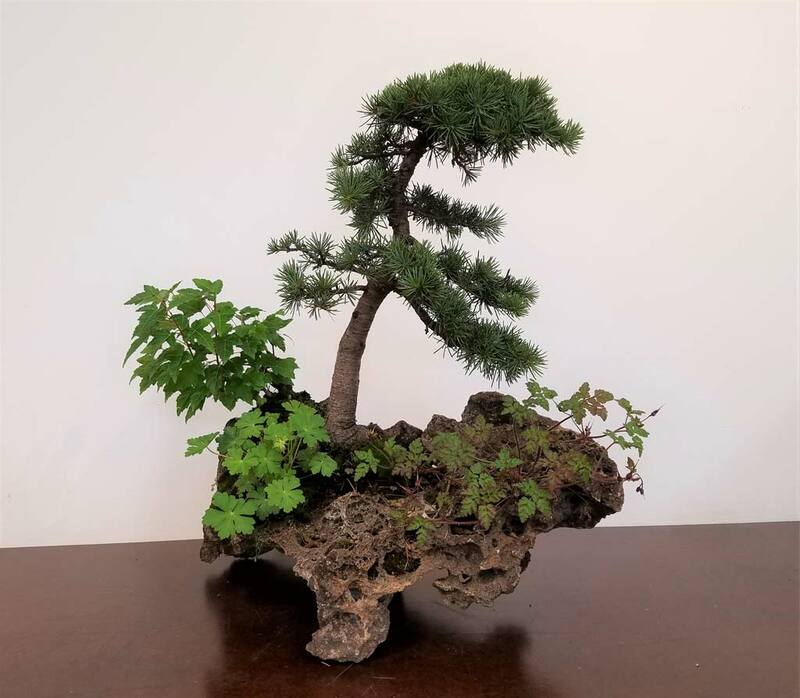 Before starting in on the rock planting of the evening, Jay first introduced us to another, older planting he had created, featuring a Nanking Cherry tree, the arcing limbs of which complemented the giant arc of the rock. Planting trees in rocks requires a fair bit of ingenuity. 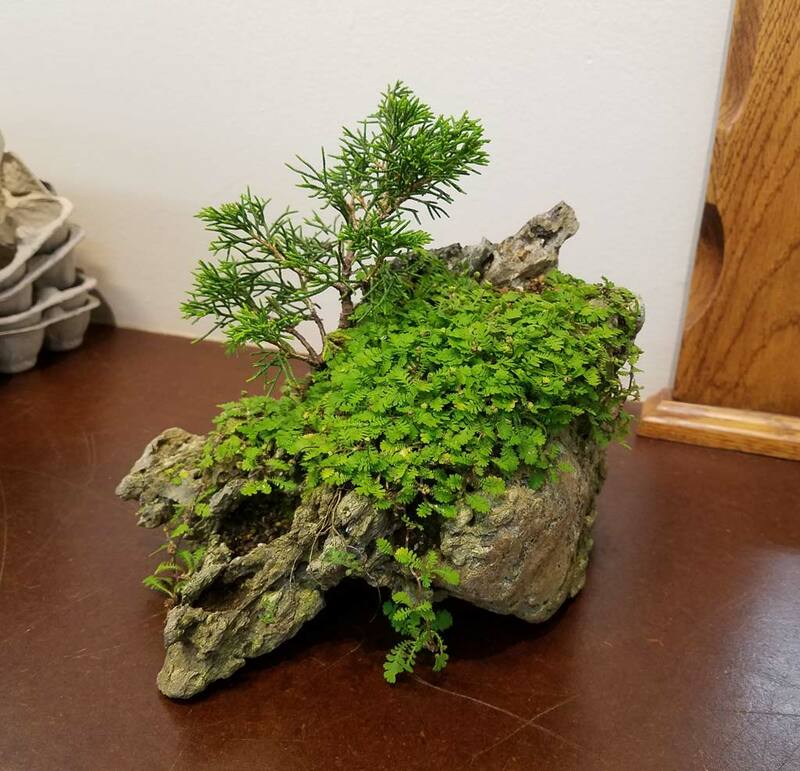 Sometimes you have to drill or chisel into a rock to create more space for roots, find unique ways to attach anchor wire, or epoxy small bits of rock in place to eliminate the tippiness of a rock. 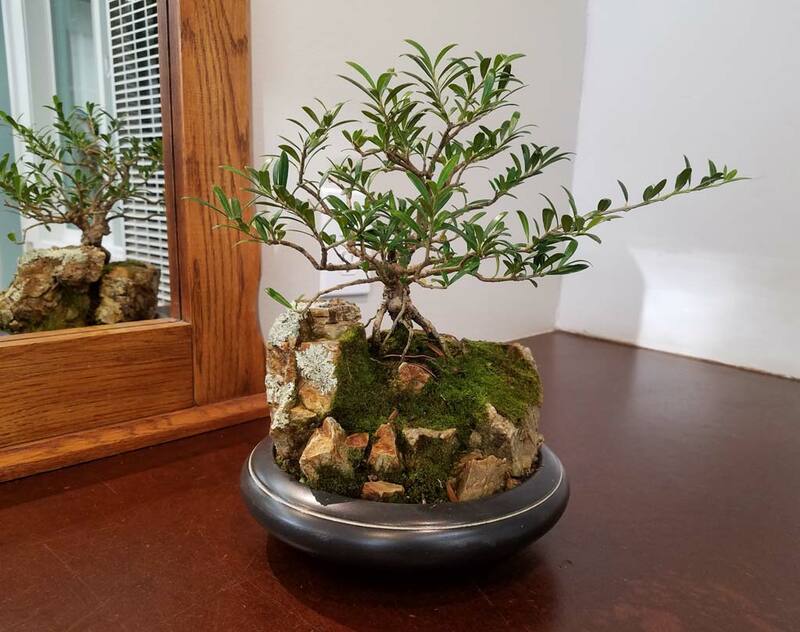 For his Nanking Cherry rock planting, Jay showed us where he had to create more root space by attaching a large piece of screen (the type we all use to cover the holes in our pots) across a gap in an otherwise high side of a natural bowl in the rock. 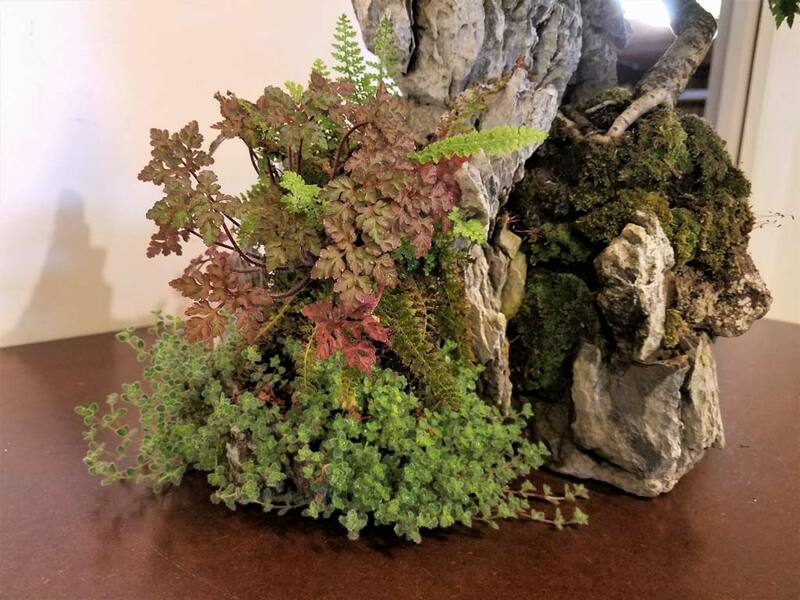 There’s no amount of accent plants and moss that will completely cover something that dramatic, but since it’s in the back of the planting, the end result works and looks just fine. 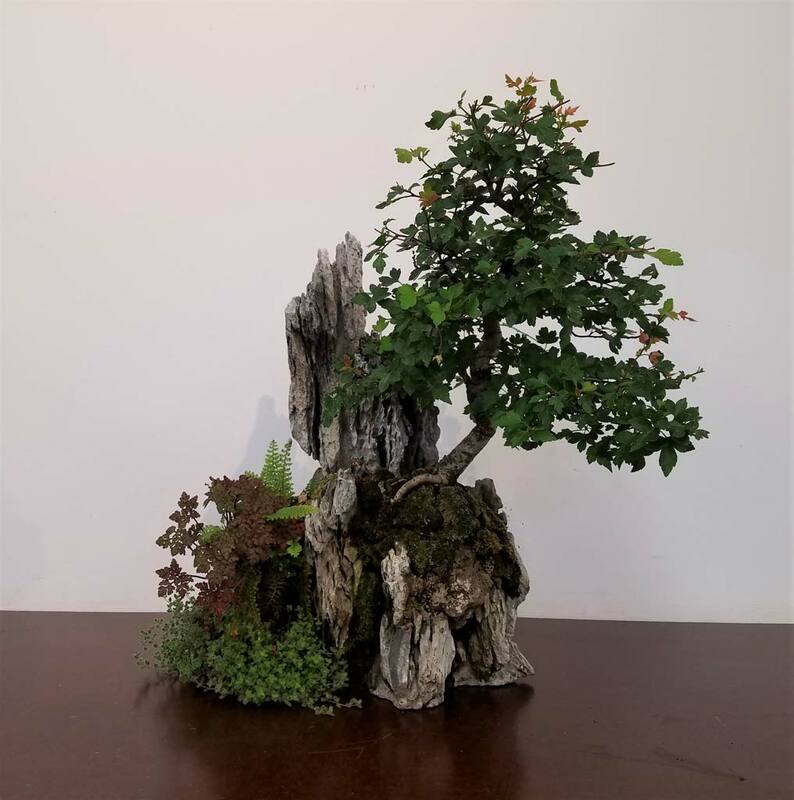 Next Jay introduced us to his current subject matter, a Cedar of Lebanon planted with a unique maple, appropriately spaced and arranged with accent plants on a nice dramatic rock. Jay was unsure of the maple type. 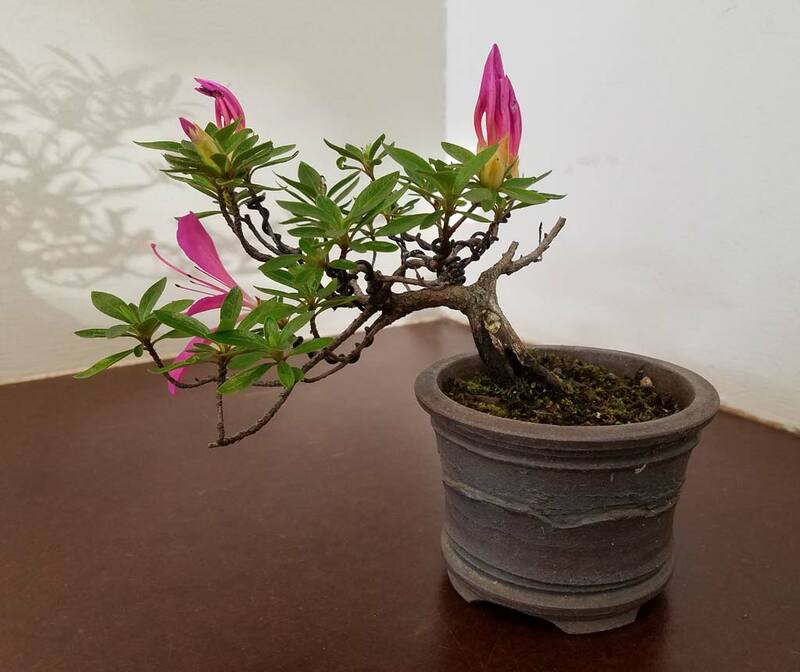 When he purchased it, he thought it might be a trident, but the spring leaves told a different story. His best guess is that it’s an Amur Maple. This is the tree he worked on first, giving it a rather heavy trim. Upon turning his attention to the cedar, Jay immediately and somewhat dramatically lopped off a rather large lower branch, partly because it had an unsightly stump on its end. 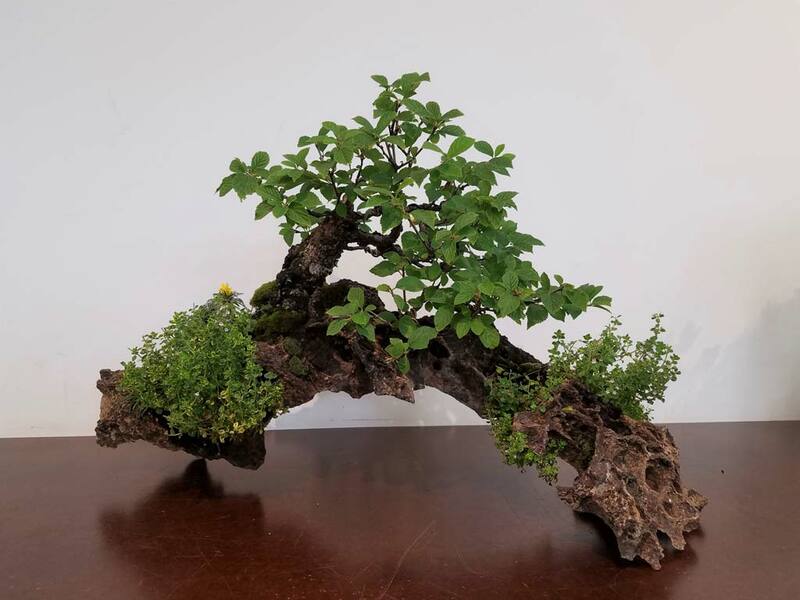 He said that he had considered jinning it, stripping the bark and carving it into deadwood, but that it was too straight and, for lack of a better word, “clunky.” In other words, it would have looked forced into the design. So off it came. Then he trimmed the cedar a little more and spent most of the rest of the demo applying wire to it. It was during this process that more of the audience began to get up and take a closer look as the demo entered its less formal final stage. 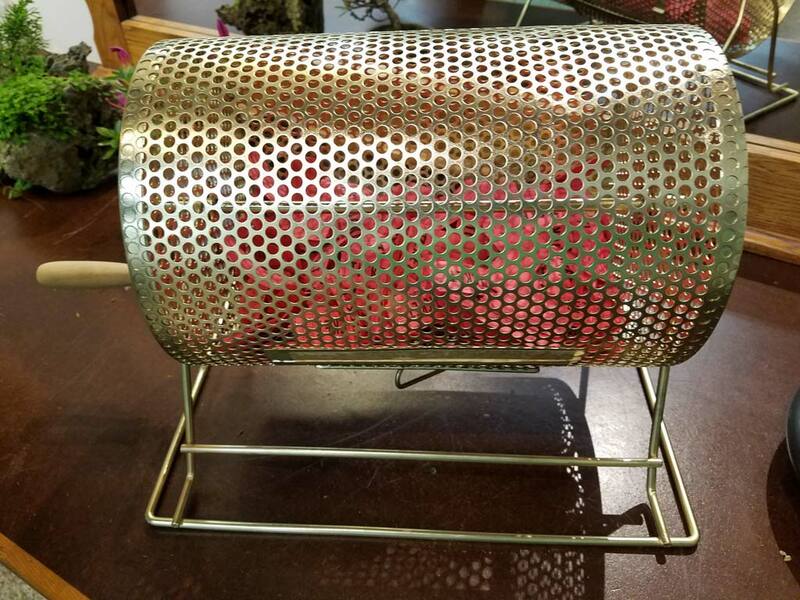 Daniel Keller was the lucky audience member who won the tree in the raffle. Want to learn more about rock plantings? 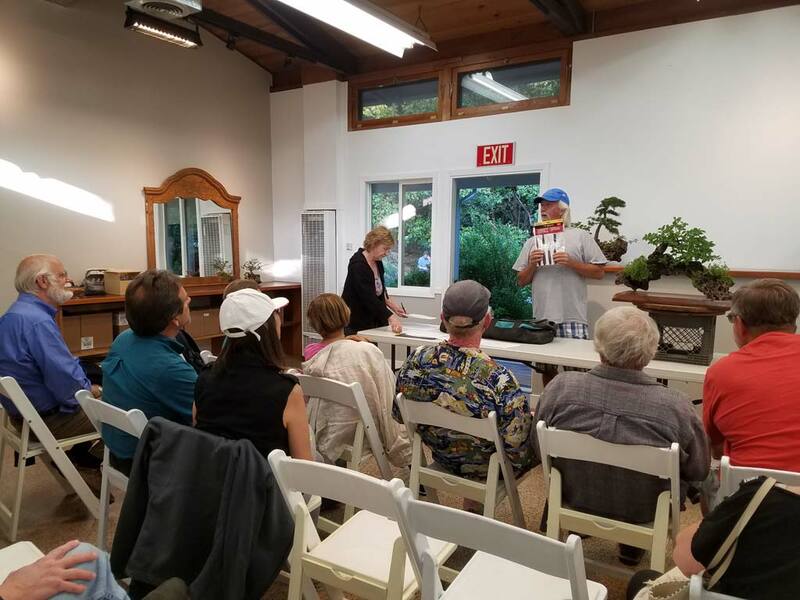 Mention them when you RSVP for the September 19th workshop and I’d be happy to bring some typical materials and tools used for the process, and a book all about bonsai landscapes.